I read this article and found it very interesting, thought it might be something for you. The article is called Investing In Good Neighbours and is located at https://archive.indiaspend.com/viznomics/investing-in-good-neighbours-19502. Ever wondered what the Government spends on staying in the good books of our neighbours? 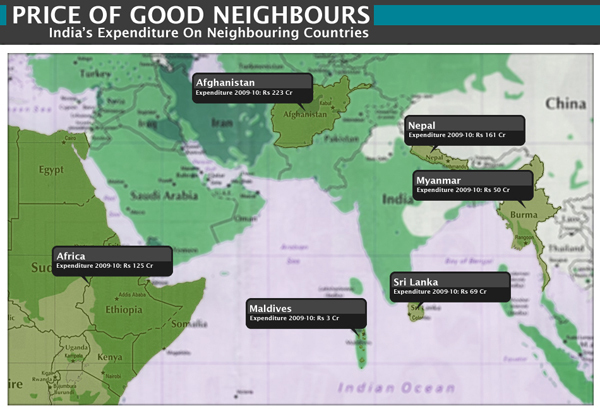 Here’s a look at what the government spent on our neighbouring countries in the last year. As you can see from the figure above, we spent Rs 69 crore on Sri Lanka last year. This year however, we have budgeted Rs 290 crore. Why you might ask? Well, for one, we seem to be buying bicycles. Yes, the MoEF is buying some 10,000 `push’ cycles, of which 7,000 are for men and 3,000 for women – if you really wanted to know how we were being gender friendly.